An odd thing happened when I was sick with the cold (or flu, whatever it was). Spinning made me cough! Weird. Dog hair yarns! I also spun the red roving I showed in an earlier post. And the 3-ply barber pole is a yarn I don’t like very much, but I know it’ll be good in a weaving project. It’s unfinished in the photo. I used coloured silk in some of the batts, and spun three different yarns. Two skeins with thicker yarn, one thin with leftovers from a bobbin with merino (I think), and two skeins with my default yarn. I like them all! 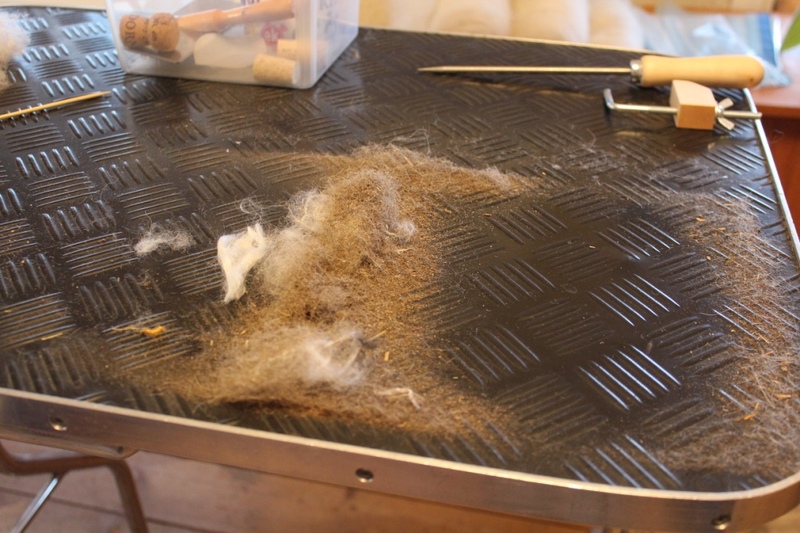 There was pretty much debris in the wool and the dog hair! Some of the silk fell through, but that’s not a problem: shake it, and the debris falls out and you can use it. After the successful carding of the rather long Keeshond hair, I wanted to try something I’ve been thinking of ever since Kasper came to live with us more than ten years ago. I’d like to spin his very short undercoat. So here we go: the 1,5-2,5 cm long Kasper hair on top, and some Kainuu Grey lamb locks underneath. I also added a little silk. Silk is magical in chiengora yarns. It binds the shorter fibers, and adds lustre to the yarn. I’m not afraid to use my scissors – I often cut silk tops into shorter lengths to make the blending and spinning short, tricky fibers easier. I haven’t spun the batts yet. As you can see, I haven’t blended the different shades of the Kainuu Grey thoroughly, as I like the heathered look very much. If I’d like an even colour, I’d card the wool separately in 2-3 passes before adding the evenly coloured Kasper hair. The undercoat from dogs is very fine and delicate, and it can’t be carded in more than 2-3 passes on the 72 tpi card cloth before it starts breaking and making pills. Great photos!! 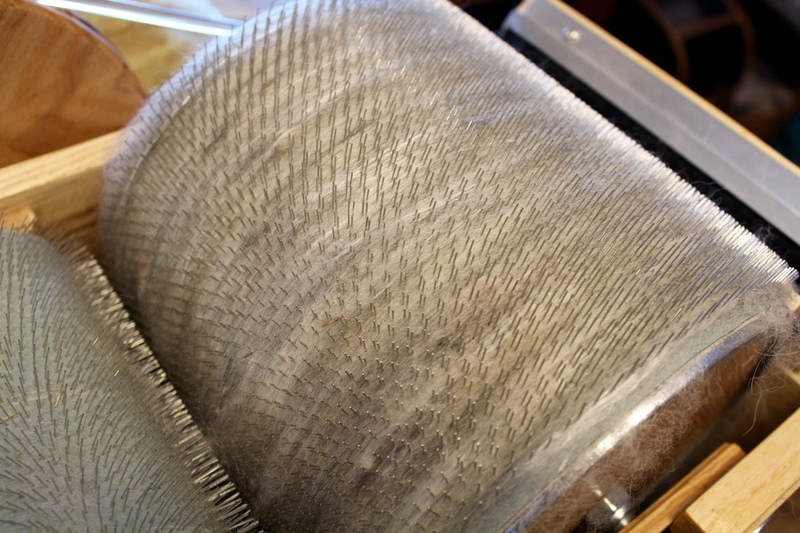 Some fibers make me cough/sneeze when I’m spinning them. My stash is slowly shrinking as I spend waaaaaay too much time spinning and knitting!! My small amounts (4 oz. or less) have all been spun up and knitted into hats, mitts and cowl. I will *try* to only purchase fleeces so I can do a big project. Thanks! I’m so glad you like my blog! Wow you really got energized after you long hiatus. Glad you got Kasper ‘under control’/ My friend Marilyn F puts silk into EVERYTHING! No doubt I will hear from her re that remark 🙂 Also like that dark red. Good health to you!! January 25, 2016 - 2:45 pm Marilyn F.
So glad you are back spinning and showing your beautiful yarns!!! 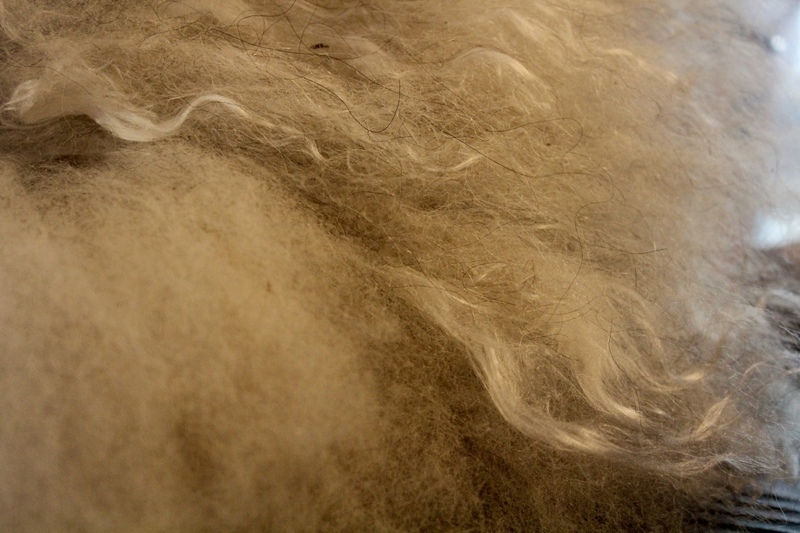 It was interesting that you used silk to bind/grab the shorter dog hair in your blend. 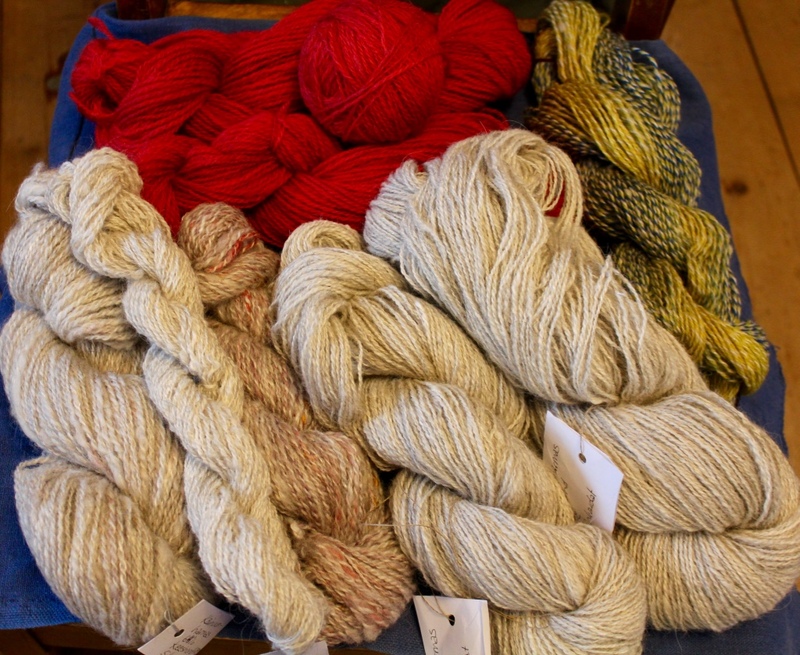 Are you using tussah or bombyx? Its also interesting that you would cut top to shorter lengths to blend with. Have you ever had problems with blunt ends sticking out of your yarn? Maybe not in dog hair because of the hallo and maybe the silk is fine enough that the ends would blend in any yarn. Not sure, I’ve never cut top but have cut silk caps/hankies to blend with. And yes (thanks Susan 🙂 I do like to blend silk with most all fibers I spin these days. 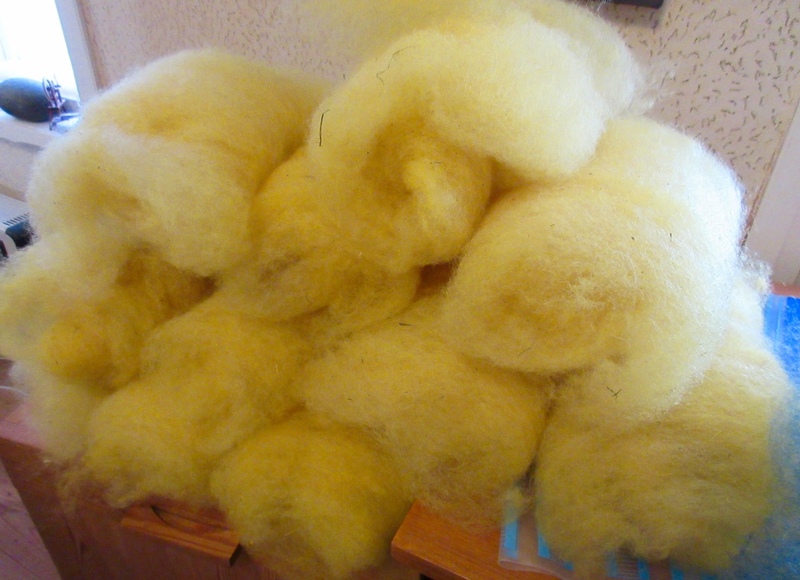 Last night I combed a lot of crud out of some dark gold tussah (dyed to look like wild cinnamon silk) and blended it with angora. It spun beautifully. You really seem to get a lot of carding and spinning done in a short period of time. Its no wonder you were doing it professionally. Great work!!! And thanks for sharing. I used bombyx in the chiengora yarn, but tussah would be just as good. I cut silk when I need short silk to blend with other short fibers. Silk is so fine, I haven’t noticed that the tips sticking cause any trouble at all. But the dog guard hair will be prickly, so I won’t use these yarns next to skin. January 27, 2016 - 3:49 am Marilyn F.
Well, I have learned from you here that I can cut silk to match the length of other fibers for blending. May give it a try sometime. I guess the silk I’ve blended with other fibers has been of similar length so it hasn’t been a problem. Thanks for the good tip. Hello, told you Marilyn would catch up to me 🙂 I had forgotten that I once spun some Leonburger and knitted gloves for the owner. she came to me after a while showed me the gloves and we both laughed…the hairs had come out to form quite a halo all around the gloves! 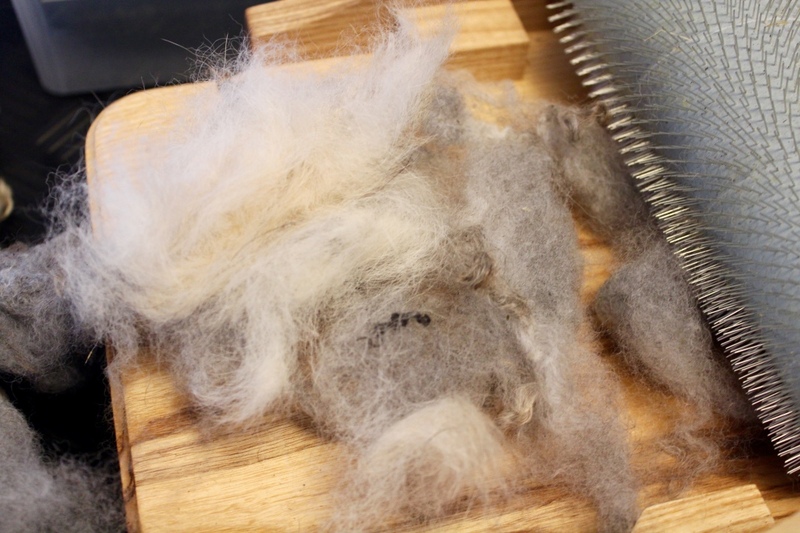 Like aliens…….. Now I would know to put some silk in with the fur…NOT that I am going to do that again anytime soon! !